A Ground Penetrating Radar survey conducted in June 2015 in Vilnius, Lithuania has uncovered the underground remains of the Great Synagogue and Shulhof of Vilna, now lying partially below a modern school. These important remnants of what was before the Holocaust, Lithuania’s greatest synagogue, will be exposed in an excavation to commence next year. The magnificent Great Synagogue of Vilna (Vilnius) in Lithuania, was the oldest and most significant monument of Lithuanian Jewry. Sadly, like most of the edifices of Jewish culture in Lithuania, the Great Synagogue was lost during the Holocaust. 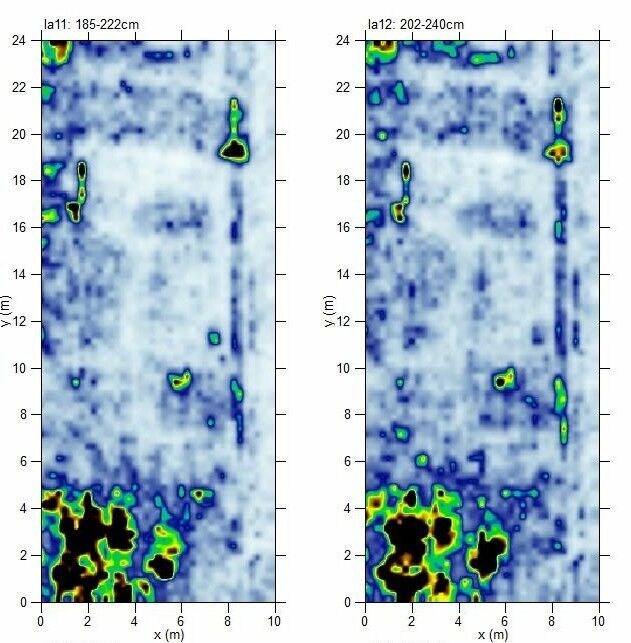 A joint team, led by Dr. Jon Seligman from the Israel Antiquities Authority, Zenonas Baubonis of the Culture Heritage Conservation Authority of Lithuania, together with Prof. Richard Freund of the University of Hartford, have just completed a successful season to identify the remains of the shul using ground penetrating radar. Built in the 17th century in Renaissance-Baroque style, the Great Synagogue of Vilna was surrounded over time with other community buildings, including twelve shuls, the community council, kosher meat stalls, the famous Strashun library, a complex of mikvaos and other communal institutions that formed a great center of limud Torah, the beating heart of the Lithuanian Jewish movement of Mitnagdim and the home for Rabbi Eliyahu, the Vilna Gaon. After centuries of existence, with the destruction of the entire Jewish community of Vilna, this most important shrine of the Jews of Lithuania was ransacked and burnt by the Germans during World War II, the remains later demolished by the Soviet authorities and a modern school was constructed on the site. In a season of work, conducted in June 2015, the results of the ground penetrating radar survey showed significant remains of the synagogue below the surface, including sections of the Great Synagogue and possible remnants of the miqvaos. Excavation is planned at the site in 2016 with the hope of exposing these remains for research and to display to them to the- general public as a fitting memorial to the important Jewish community of Vilna. It is proposed that the future excavation will be conducted by a mixed team of archaeologists and student volunteers from Lithuania, Israel and the worldwide Jewish community, with the aim of ensuring that Jewish built cultural heritage is seen as an important and inseparable part of Lithuanian heritage that needs to be celebrated by all and preserved for perpetuity. A joint team also includes Professor Harry Jol of the University of Wisconsin, Eau Claire; Professor Philip Reeder of Duquesne University and Dr. Vladimir Levin of the Center for Jewish Art, Hebrew University of Jerusalem have just completed a successful season to identify the remains of the synagogue using ground penetrating radar. And in the future, the Batei Medrashim and Batei Kineisiyis will uproot and be transplanted in Eretz Yisroel. Not only do we have a Slabodka, a Telz, a Ponovitch, a Mir, a Slonim, a Ger, etc, but the actual, original mekomos are experiencing their very own techiyas ha’meisim. They are merely in geniza, still giving forth their kedushah, only to be resurrected to their fullest glory and splendor when the proper time arrives. Very nice and informative but what is “movement of Mitnagdim” supposed to mean? Why belittle the greatness of what Vilna the Yerushalayim of Lita was and represented, by giving it such a ridiculous label? Aside from the fact that many chassidim lived in Vilna and other parts of Lita, how can a “movement” be defined as being “mitnaged” or against something. Where are the records of the founding of this “movement”?